Model Variants have been added to the new version of 3DCS. This much requested feature allows users to designate different model builds within the same model. This reduces issues with version control, as well as removing the need for multiple cloned versions of the same model in order to simulate different processes, parts or tolerance schemes. 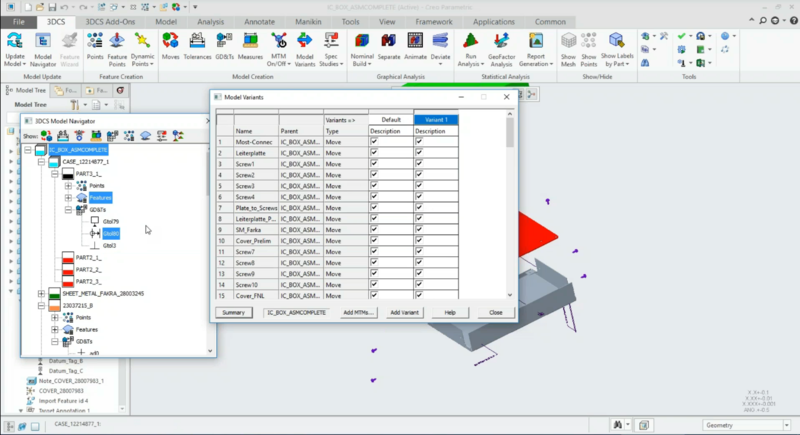 Now, within the same model, users can define different assembly methods, tolerances or GD&T, and measurements for each variant, swapping between them with the push of a button. This makes it easy to model different what-if scenarios, or to model parts and processes from different suppliers. With the added functionality of both multi-core processing and cloud based distributed processing, it becomes a simple process to switch between variants and quickly run analyses to compare outputs. Join DCS for their next webinar, What’s New in Version 7.6, on March 28th at 11 am EST, or visit DCS on the web at https://www.3dcs.com/technical-support/dcs-webinars-on-demand to watch all of the previous videos and webinars On-Demand. Did You Miss the First Part on the New GD&T Interface? 2. Simplify the tolerance process -- Utilize the standard language of GD&T to plainly add tolerances onto your model.